ho, ho, ho? or no, no, no? Recently I have been asked repeatedly how can we, as Christian parents, reconcile the secular Santa Claus with the birth of Jesus. That my friends is a big, big question, that I hardly have the answers to. It is not a debate that I want to engage in to either. Do my kids excitedly meet Santa? Do they ask him to bring them something? Do they think that he is the reason for Christmas? No more than Mickey Mouse is the reason for Disneyland. Do they believe in him? Just like they believe in Star Wars, unicorns, fairy tales, Narnia, and princesses. Do I think that their rich imaginations are going to be a stumbling block to their relationship with God? I often wonder if imagination is the beginning of faith. Besides, what is bigger than the imagination of the Creator of the Universe? What I do know, is Santa is not the focus of the season in our family. There is a nativity set in nearly every room of the house. We read the Christmas story together. We sing carols as we drive around looking at lights each night. They practically know the books The Crippled Lamb and The Tale of the Three Trees by heart. They give away many more toys than they will receive under the tree come Christmas morning. We then cap off the season with a huge birthday party for Jesus, complete with cake, decorations and balloons. Yes. Santa is part of the story. But he is not the whole story. The story to us is grace, hope, love, giving, and celebration. We pray that is the part of the story that they will carry with them. Because it is such a beautiful, beautiful story. God's grace came down in all humility, bringing us good news of great joy. Hmm I like that thought, imagination is often the beginning of faith. Like it a lot. Santa is fun. Santa is not it. Santa has his place: second in line. i agree one hundred and fifty percent. and that santa rocks. much better then the one with the drawn on eye brows my kids saw this year. There is an awesome book called I Believe in Santa Claus. It makes comparisons between Santa and Christ and how Santa can remind us of Christ. I highly recommend it. I completely agree. Also, the story of how Santa began is true. So it's not a stretch, it's just an evolution of a real person. My son (who is 2) got this letter in the mail (not sure where it came from) signed your friend Santa and it is says to remember and celebrate the birth of Jesus and that he will be pausing to say a prayer and remember the reason for the season. The letter also came with a star ornament with the year on it. In fact we simply add in that we think Santa might be the most excited about Jesus' birth and loves to celebrate by bringing presents. Beautifully said. Just what I believe too. My husband and I had this debate when we were pregnant with our first. We decided to have fun with Santa but not go crazy with him. This year our oldest turned 6 we knew his Santa years were just about over. Last week he came to me and wanted an honest answer if Santa was real. I told him the truth.. that Santa was a man who lived a long time ago that gave gifts to children to celebrate the greatest gift ever given to us on that very same night. I was happy with how beautiful my story came across and thought he was completely satisfied. I didn't worry at all that he felt lied to or cheated in any way. And then he asked me if Jesus was real or if we made him up too. I was crushed and the thought that I might have put that doubt there still terrifies me. But I think in hindsight I realize that there was nothing wrong with his question. It is a question that he would have considered someday but maybe never spoken out loud if it hadn't come up at such an innocent and honest age. Did I just totally high jack? beautifully said - I love it! You're raising your kiddos right! I love the way you worded this! Oh and Jen from Lipstick in Laundry: I totally agree with you on Santa and his stocking stuffers. That is what we tell our little girl too. :) Maybe it is selfish, but I want credit for the big stuff. There's a great book called "I Believe in Santa Clause" that we read each year at our house. It is my favorite Christmas book becuase it paralells Santa and Christ in one book. I love it, and it makes Santa a little less frivolous and a little more religious. 3 out of 3 of our children still believe. And I don't think it will hinder their relationship with Jesus one bit. Santa Claus is a "fun" aspect to the holiday, but he brings a present (he's not getting credit for more than that!) and stockings and is fun to visit at the mall once a year, but we really try to focus on Jesus, the birth, and the real REASON. We talk about and have Jesus with us all year. Santa only comes around once a year. My 6 year old has made comments twice about Santa being just like God or as good as God and that crushed me. After that I decided to tell her that he wasn't real but she yell at me in a shock voice "How could you say that?" I couldn't help but laugh and I guess she thought I was joking. She hasn't said anything about it again. That night we watched Santa Claus is Coming to Town and I really think it was timely. We did the same things with our now 22 year old son and he is a strong Christian man so I don't see the harm in it. In fact, I had a discussion with my 7 year old the other day, when he told me that he would tell Santa the he wanted a guitar. And I said, "I don't think that's a good idea" and he said "if santa doesn't give me a guitar, I'll be disappointed". And so we had to have a talk about no matter what gifts you get, you have a lasting gift in the birth of Jesus...and so because you always have the gift of Jesus, you will never be disappointed. I'm not a Christian, Julie, but I think this post is absolutely lovely. Though I don't believe that Jesus is the savior, I do believe he walked the earth and tried to do good. I also believe that those who try to truly live in his spirit, do good. Repeatedly, I find myself saying to myself, wow, what a wonderful sentiment. you have great balance. that's what i'm strivin' for for our babies. LOVE how you said it! Santa is fun and kids should be able to enjoy the fun of it. Would you write one about Halloween next? Cause that really sends people into a head spinning fit. Anyway, I wrote this little blurb on our family's take on Santa last year. Or be irritated by it. In the grand scheme of things, I would much rather have my daughter enjoying Santa than Hannah Montana. But that is a whole nother can of worms, isn't it? Spot on. LOVE this! I could not have said it better. Thank you! Amen, sister. Maybe you've seen this article? Ah--love the three trees book...ever read I Believe in Santa Clause?? Love that one. That helps too. It makes a comparison between Santa and Christ (comes in the night, loves little children,wears red, brings gifts, hopes/knows we are good.) It's simple but powerful! because it's a recurring question in my head, i was very eager to see how you *wrestle* with it all. i love your willingness to let the question go unanswered. it so much like our faith. we're given certain answers and then we must be willing to accept and celebrate the mystery. love to you and your family this christmas ms. julie! Sorry to be off topic, but can we get a post on that adorable dress in the last picture? Bravo!! It couldn't have been better said. Thanks Julie! You know, I think every parent struggles with the Santa question, whether they are Christians or not. I am an atheist and we raise our children without the teachings of religion or God (they are 2 and 4 so the topic has not come up yet). I also feel guilty "lying" to my children about Santa but really believe he is just part of the Christmas season and he's really more of a "feeling" than he is a real person. Once they're older, I hope to teach the "spirit of Christmas" to them more than an actual man in a red suit. Very nice post. I tell our kids that the season is about giving. Santa gives and God gave us his son Jesus. We too have cake, for the day is a birthday and we treat it as such. Merry Christmas to you and you family. A great book to read with your kids is The Autobiography of Santa Claus. We are a Christian family and our kids have grown up believing in Santa Claus. If you read the book you learn how Santa Claus was originally St. Nicholas from Myra and over the years he decided to combine his gift giving in celebration of the birth of baby Jesus. My kids are 11 and 9 and while my oldest revealed this year he no longer believes in Santa he does believe in the spirit and magic of Santa and this book has been wonderful for him. He is not disappointed, does not feel cheated and still understands that Christmas, for our family, is a Christian celebration. THank you for your words! I love what you said. It is not all about Santa. It is not difficult to teach children the real meaning. We just have to live it ourselves. We are Christians ... and, yes, Santa has always been included in Christmas. It's fun. And ... guess what, my sister & I always knew that Jesus was #1... so... really - as long as you make sure your kids know that Jesus is what it's all about ... why not have fun with Santa? I think it's sad when I know kids who "don't do Santa," yet they hear their friends talk about him & read books about him and such - it's sad. Awesome post. Leila told me what she thinks about Santa last night...."mauybe he's just like when a princess comes to a birthday party. Maybe he just helps out with Jesus's birthday party." When I was eight ( I know old, right?) and my brother told me that Santa was "my Mom & Dad" I simply could not believe it. I ran into the house with tears running down my face & asked my mom directly if it were true or not. She got down and looked me right in the eye and said, "Santa is a piece of Christmas. He represents the spirit of giving. Just like God sent His son as the ultimate gift to each of us, the spirit of Santa is a fun example of how we should give freely to others, especially during the time of year when we celebrating the birth of Jesus." I got it. I struggled a little with "spirit" but I understood Santa was part of that magical feeling of being given a gift with no strings, just like salvation. 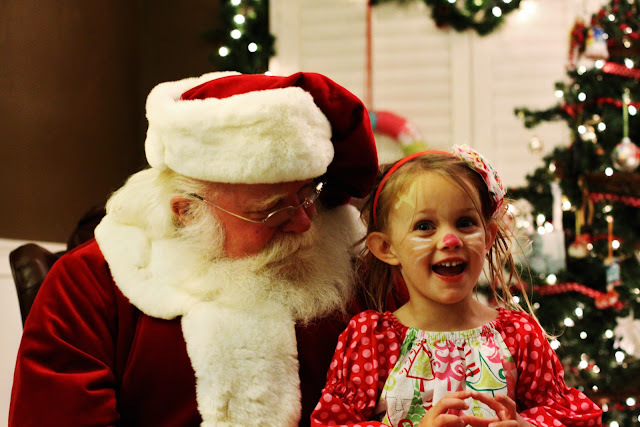 We just try not to go overboard with Santa and I think that when they are old enough to ask, "Is Santa REAL?" it isn't good to lie to them. We talk about the real St. Nick too. But Jesus is our primary focus during this season, not Santa or presents (or at least we try not to let it be!). :) Some people go a bit overboard (in my opinion) with Jolly the Elf flying around and "Naughty vs. Nice". Such good thoughts! 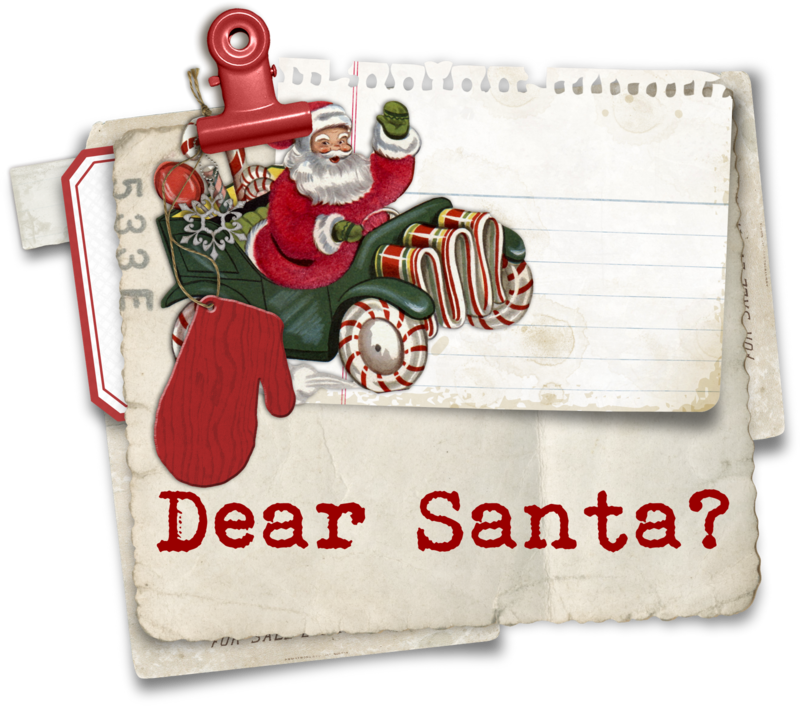 I read a blog this week that said we have 3 choices: reject Santa, receive Santa, or redeem Santa. As a child I grew up in a Christ-centered home and Santa was welcome. It in no way hindered my faith. I knew from an early age Santa wasn't the big deal, Jesus was the biggest deal there is. I love C.S.Lewis was introduced to the gospel through the baptism of imagination and wrote in such a way to give that gift to others. Wow! God really can use anything and it can be redeemed for his glory. I second this post. He is a part but not THE reason for us too. Thanks for this! I actually just posted on this topic as well. And one of your readers linked to this post in my comments. I love it!! great post. i LOVE your daughter's top/dress in the pic w/santa!! i'd love to see the whole thing...no way you'd have a pattern would ya?? hahaha. merry CHRISTmas!